It's no small task to take a short, beloved children's book and turn it into a full length feature film, but that's exactly what Spike Jonez did for the 2009 production of Where The Wild Things Are. One of critics and audiences favorite characters was Carol, the melancholy and often temperamental imaginary monster from jungles of Max's mind. And it's this free spirited character that so many young children can relate to. Carol enjoys inventing and often feels misunderstood, like how so many kids can feel. He's a free spirit that cares so deeply about things around him that he reacts destructively and, sometimes, without thinking of others. We can all relate to that as adults, but especially when we see young children who tend to have outbursts in such similar ways. This parallel is what makes this Baby Where The Wild Things Are Carol Costume so perfect. This officially licensed outfit is 100% polyester. The yellow and orange jumpsuit has tan printed scale pattern legs and snaps along the back and legs. 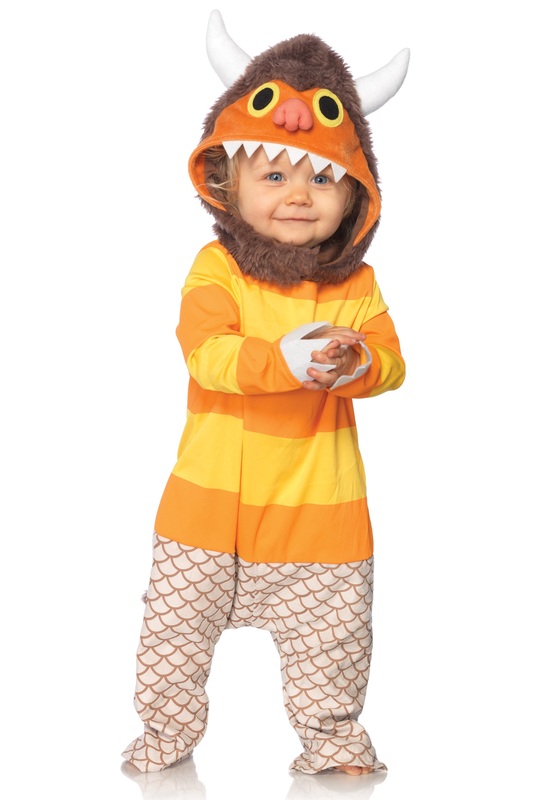 The top of the costume has an ultra soft fuzzy brown monster hood with horns and a mouth on the top. Be sure to check out our other Where The Wild Things Are costumes and make this Halloween a group theme, because we have costumes for the whole family!